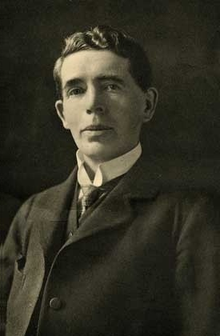 John Bagnell Bury, FBA (16 October 1861 – 1 June 1927) was an Irish historian, classical scholar, Medieval Roman historian and philologist. He objected to the label "Byzantinist" explicitly in the preface to the 1889 edition of his Later Roman Empire. He was Erasmus Smith's Professor of Modern History at Trinity College Dublin (1893–1902), before being Regius Professor of Modern History at the University of Cambridge from 1902 until his death. Bury was born and raised in Clontibret, County Monaghan, where his father was Rector of the Anglican Church of Ireland. He was educated first by his parents and then at Foyle College in Derry. He studied classics at Trinity College, Dublin, where he was elected a scholar in 1879, and graduated in 1882. He was elected a fellow of Trinity College, Dublin in 1885 at the age of 24. In 1893, he was appointed to the Erasmus Smith's Chair of Modern History at Trinity College, which he held for nine years. In 1898 he was appointed Regius Professor of Greek, also at Trinity, a post he held simultaneously with his history professorship. In 1902 he became Regius Professor of Modern History at the University of Cambridge. At Cambridge, Bury became mentor to the medievalist Sir Steven Runciman, who later commented that he had been Bury's "first, and only, student." At first the reclusive Bury tried to brush him off; then, when Runciman mentioned that he could read Russian, Bury gave him a stack of Bulgarian articles to edit, and so their relationship began. Bury was the author of the first truly authoritative biography of Saint Patrick (1905). Bury remained at Cambridge until his death at the age of 65 in Rome. He is buried in the Protestant Cemetery in Rome. He received the honorary degree Doctor of Laws (LL.D.) from the University of Glasgow in June 1901, and the honorary degree Doctor of Letters (D.Litt.) from the University of Oxford in October 1902, in connection with the tercentenary of the Bodleian Library. His brother, Robert Gregg Bury, was an Irish clergyman, classicist, philologist, and a translator of the works of Plato and Sextus Empiricus into English. Bury's writings, on subjects ranging from ancient Greece to the 19th-century papacy, are at once scholarly and accessible to the layman. His two works on the philosophy of history elucidated the Victorian ideals of progress and rationality which undergirded his more specific histories. He also led a revival of Byzantine history (which he considered and explicitly called Roman history), which English-speaking historians, following Edward Gibbon, had largely neglected. He contributed to, and was himself the subject of an article in, the 1911 Encyclopædia Britannica. With Frank Adcock and S. A. Cook he edited The Cambridge Ancient History, launched in 1919. I may remind you that history is not a branch of literature. The facts of history, like the facts of geology or astronomy, can supply material for literary art; for manifest reasons they lend themselves to artistic representation far more readily than those of the natural sciences; but to clothe the story of human society in a literary dress is no more the part of a historian as a historian, than it is the part of an astronomer as an astronomer to present in an artistic shape the story of the stars. Bury's lecture continues by defending the claim that history is not literature, which in turns questions the need for a historian's narrative in the discussion of historical facts and essentially evokes the question: is a narrative necessary? But Bury describes his "science" by comparing it to Leopold von Ranke's idea of science and the German phrase that brought Ranke's ideas fame when he exclaimed "tell history as it happened" or "Ich will nur sagen wie es eigentlich gewesen ist." [I only want to say how it actually happened.] Bury's final thoughts during his lecture reiterate his previous statement with a cementing sentence that claims "...she (history) is herself simply a science, no less and no more". In his book, History of Freedom of Thought he said the following. Some people speak as if we were not justified in rejecting a theological doctrine unless we can prove it false. But the burden of proof does not lie upon the rejecter.... If you were told that in a certain planet revolving around Sirius there is a race of donkeys who speak the English language and spend their time in discussing eugenics, you could not disprove the statement, but would it, on that account, have any claim to be believed? Some minds would be prepared to accept it, if it were reiterated often enough, through the potent force of suggestion. ^ Goldstein, Doris (October 1977). "J.B. Bury's Philosophy of history: A Reappraisal". The American Historical Review. 82 (4): 896–919. doi:10.1086/ahr/82.4.896. JSTOR 1865117. ^ Bury, John Bagnell (1930). "The science of history". Selected Essays. CUP Archive. p. 9. Retrieved 1 April 2015. I may remind you that history is not a branch of literature. The facts of history, like the facts of geology or astronomy, can supply material for literary art; for manifest reasons they lend themselves to artistic representation far more readily than those of the natural sciences; but to clothe the story of human society in a literary dress is no more the part of a historian as a historian, than it is the part of an astronomer as an astronomer to present in an artistic shape the story of the stars. ^ Stern, Fritz (1972). The Varieties of History: From Voltaire to the Present. Random House. p. 214. ISBN 0-394-71962-X. ^ Goldstein, Doris (October 1977). "J.B. Bury's Philosophy of history: A Reappraisal". The American Historical Review. 82 (4): 897 (896–919). doi:10.1086/ahr/82.4.896. JSTOR 1865117. ^ Bury, J. B. (1913). History of Freedom of Thought. London: Williams & Norgate. p. 20. ^ Richards, F. T. (25 November 1893). "Review of A History of the Roman Empire, from its Foundation to the Death of Marcus Aurelius by J. B. Bury". The Academy. 44 (1125): 459. ^ Thorndike, Lynn (April 1929). "Review of The Invasion of Europe by the Barbarians by J. B. Bury". The American Historical Review. 34 (3): 564–566. doi:10.2307/1836287. JSTOR 1836287. Wikimedia Commons has media related to John Bagnell Bury.